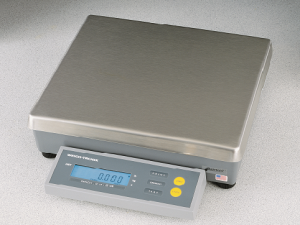 The high-resolution Quartzell™ digital transducers employed by the 3600 Series Bench Scales yield pure digital output with a standard resolution of 10,000d. Quartzell transducers – High resolution, digital output from a rugged load cell structure. RS-232 standard output – Links to printers, manifest systems, computers, process control systems. Stainless steel shroud – Resists damage; maintains its good looks for years. DuraBridgeTM construction – On heavy capacity 18 x 18-inch decks. Deck deflection is less than 1/2-inch. Minimizes off-center loading error. Selectable scale configuration -Choose scale resolution, display update rate and filtering level from the front panel. Wall mount bracket – Move the scale indicator to remote location. This option includes six feet of interface cable. Ball-top shroud – For conveyor systems, speed processing, cut lifting to a minimum. Remote post display – Choice of 9-inch or 18-inch versions with 6-foot cable. Battery operation kit – Twenty-four hours of continuous operation. Internal battery charger lets you recharge the?battery while the scale is being used. Up to 500 discharge/recharge cycles. Remote battery charger – Charges two batteries at once. 230 VAC operation.